Still from CCTV footage issued by West Midlands Police of the moment an off-duty police officer was stabbed in an attempted car-jacking on Moreton Avenue, Great Barr in Birmingham. A policeman has been discharged from hospital after being stabbed in the chest during an attempted carjacking caught on CCTV. West Midlands Police said the West Mercia officer, who was off-duty at the time of Wednesday's attack in Great Barr, Birmingham, is now recovering at his home. The force has released CCTV of the incident captured by a camera at a nearby shop at around 1.30pm. The victim was approached by a masked offender who demanded the keys to his car before lashing out with a knife. 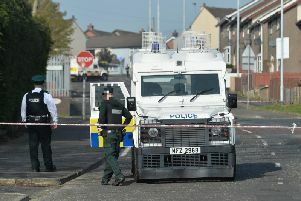 The 25-year-old officer was taken to hospital and treated for his injuries, which are not said to be serious. Detective Inspector Chris Fox, from force CID, said: "I am appealing for anyone with information on what happened to come forward and speak to us. "The offender made off from the scene in a dark blue Ford Fiesta. He was wearing dark clothing but, as can be seen in the video, the hood appears to be of a shiny material. Do you recognise it? "If you know anything, no matter how insignificant it may seem, please get in touch as it could be vital to our investigation." Anyone with information is urged to contact West Midlands Police on 101, via Live Chat on the force website between 8am and 9pm, or anonymously via the Crimestoppers hotline.